I have a very small, very stuffed wardrobe that as you know I overhaul with great regularity. Every so often I sell something, them immediately regret it and spend the next few months scouring the shops trying to replace it with the Exact. Same. Item. It’s sort of an occupational hazard of having a serious shopping addiction habit. To make room for the new I have to retire the old. 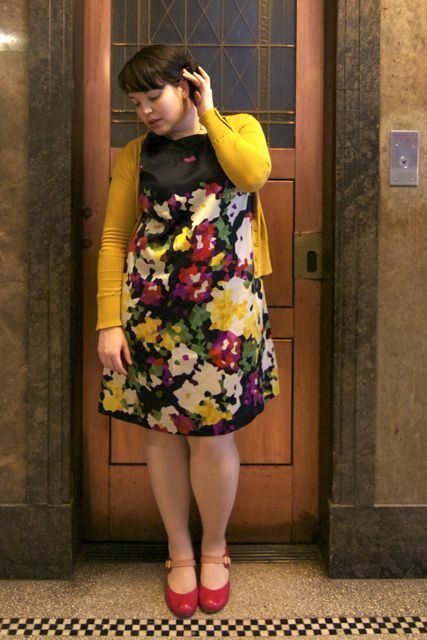 This dress was a pretty close call – every time I do a big eBay sale I have at least one buyer who flakes at the last minute & doesn’t follow through with the purchase. The last time it was the buyer who had bid for this; my Satin Rises dress. It’s called “Nina”. It costs $545. According to the website “there are only 8 on the planet”. I’ve actually got ANOTHER eBay sale going on at the moment if anyone’s interested. Wonder what I’m going to regret this time?! Meanwhile, I’m having a bit of a hair dilemma: I’m starting to look for wedding hair styles, and am wondering whether or not to keep the fringe. If I want to swap out the blunt-cut bangs for a side-swept fringe I’ll have to start growing it out now. It’s long enough to shove to one side already, so I’m giving it a go. What did you think? 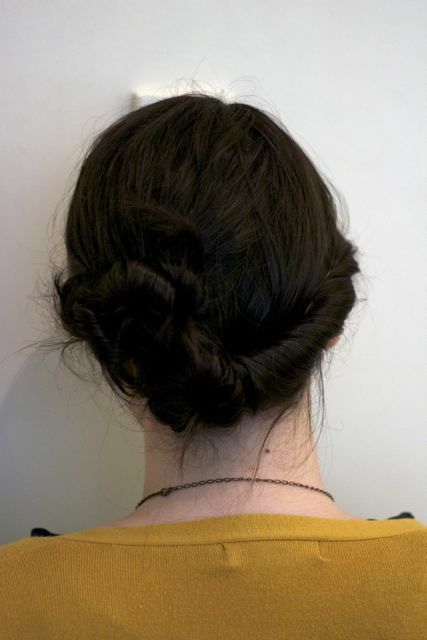 The hairstyle’s a pretty slapdash attempt at this Martha Stewart Side Chignon tutorial that Jessie McAwesome sent me. Don’t get me wrong; I love the fringe. If you’ve been reading the blog long enough you’d know that getting the fringe was a statement. My Ex hated the fringe when I’d first had it cut in 2007 so I grew it out. Practically the first thing I did when we broke up was call my hairdresser and make an appointment to reinstate it. It wasn’t a fringe anymore, it was The Fringe. Actually, I’m hankering for a full crop, but I want to keep the hair long because I’m envisaging an elegant up-do for the big day. 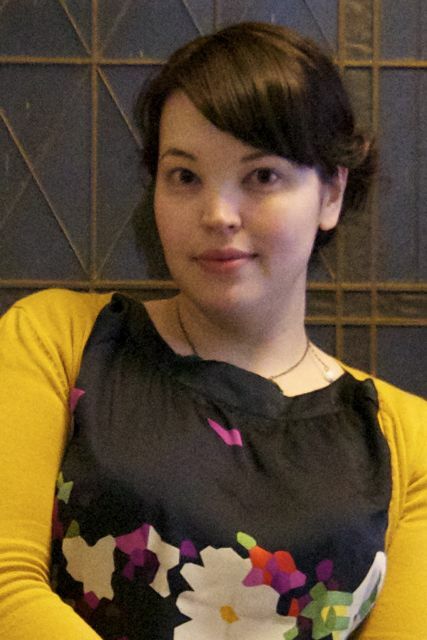 If I can wait that long… I’m looking at photos of my short-haired self in the archives and I’m pretty tempted to get the chop at my Hairy Godmother appointment next week! 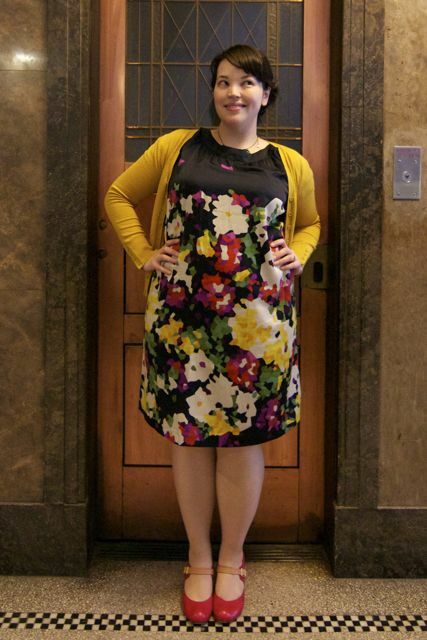 This entry was posted in Uncategorized and tagged barkins, cardigan, Chie Mihara, dress, warm by lillipilli. Bookmark the permalink. Have to say, I actually think I prefer your hair longer, with the fringe of course. Maybe cos I’m currently growing my hair into a similar style. And the pictured hairstyle attempt is fantastic, I like how it isn’t perfect but still stylish and sweet. Thanks, Bec! A lot of people are saying they prefer the longer look, and I definitely think it’s more suitable for a wedding. I like a good up-do, too! As much as I love the hard bangs (I have them on and off myself), I feel like they’re something that might ‘date’ your wedding photos. Not quite as badly as the 80s perm or mullet, but they just seem to be something that’s very ‘now’. That aside I think the side fringe is a much softer, romantic look! Definitely more romantic, and probably more in keeping with the look of the dress too! I really liked your “F*CK YOU!” haircut when you broke up with your ex. I understand your want for an up do for the wedding but I’ve seen some pretty cool brides with bird cage vails and short hair recently so don’t let it put you off. I had a long bob and just got some of it swept up. I’m so pleased that dress didn’t get sold! When I saw it on your ebay sale I was like “Oh NO! I love that dress on you!”. Its is beautiful. I’m going to have a chat to my hairy godmother about recommending some hairstyles for both cuts, then I can make a more informed decision closer to the date, I think. I had a square cut fringe for my wedding, with an up-do. I still have my square cut fringe, wont go without it! I too grew mine out for a boy who didn’t like it, then cut it back in soon after breaking up. The silly things we do for boys….. So I guess make sure you feel you in whatever you wear/style and make sure it goes with the whole “theme”. LOL, my Mum thinks long will suit the dress much better, and I’m inclined to agree – I’ll wait to make a decision closer t the date, I think! Gorgeous dress. I’d leave it long for now, so much more choice of what you want to do with it on the day! Even if you cut a fringe 2 days before the big day, at least you had that choice! So lucky you didn’t sell the dress! It’s very pretty. I really like you with the China doll cut in the first picture, blunt fringe but length not so short so it still frames your face. But I also always like the hair done up with a swept fringe at weddings, I find it so timeless. Decisions!! Good luck with the decision making! I’m sure it will be fantastic either way. Thankyou! I think I’ve decided to wait until I can put my dress on and stand in front of the mirror practising before I make any big decisions! Thankyou! 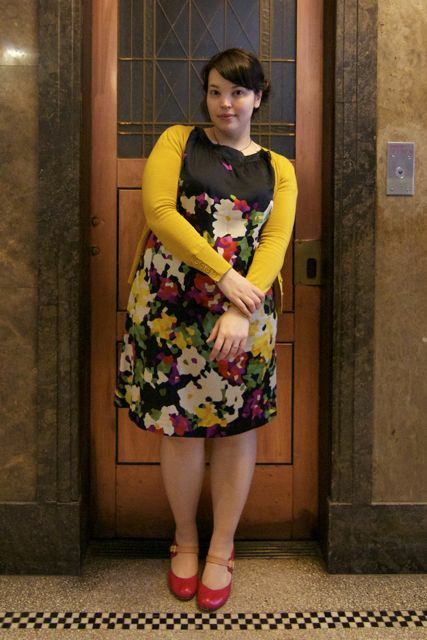 I love mustard… I wish I could find some mustard shoes, though! I totally agree with Ms. McAwesome… get all dolled up but don’t lose that certain something that makes you, YOU. And don’t worry… I know what ever you decide to do, you’ll look gorgeous! Beautiful dress! You look lovely as always! I like whatever cut is the bottom left the best. I’m SO tempted to get the crop again. If I could only just guarantee somehow that my hair would look that good EVERY day! I find when I have short hair, I’m much more at the mercy of the Bad Hair Day! the fringe NEVER goes out of vouge. Classic and cute and it really suits your features. And I think your hair long looks really great. It slims your face and lets face it,when you have longer hair you always have more options. thats my two cents! I actually said “oh!” out loud when this page loaded–that’s how much I LOVE your hair in these shots. For what it’s worth I think the way you’ve pushed the longish fringe to the side in this post and your last one is great and enormously flattering. And this chignon. It is perfection on you. You are insanely adorable. LOL, thanks Nicole! My too-long/too-short fringe is driving me nuts at the moment, good to her it still looks OK though! 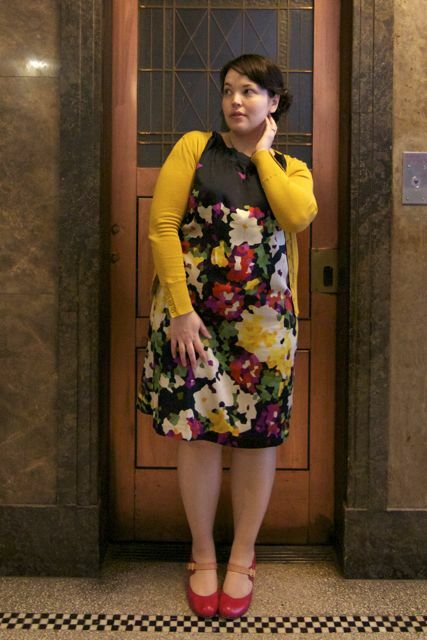 Mustard yellow – oh, how I love thee! The colors in this outfit are just beautiful, you look great! Well, I think it’s good to have options, so I’d keep growing the fringe, but I think I like your full fringe better than side fringe. Personally I think you look even prettier with short hair than you do with long. I definitely love the blunt fringe – I think the side fringe might suit the dress better though…. will have to wait and see when the dress is finally finished! Thanks Mel – I’m definitely leaning towards growing it out. I think it’ll suit the dress better. 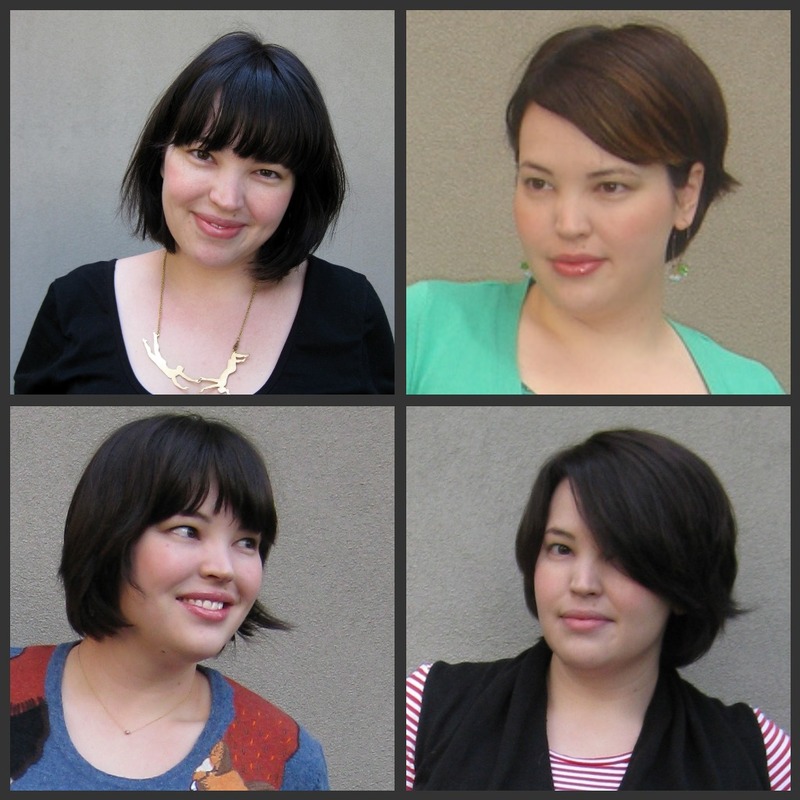 Lilli the hair do you are sporting in this post looks great on you, so soft and romantic. Don’t go for a blunt crop cut yet..maybe keep it for your honeymoon pictures 🙂 Btw I am in love with this mustard-yellow cardigan of yours, when did you buy it from Cocolatte? Because the one they have right now is a bright yellow, and I am looking for something mustardy. h blast – I’ve credited that wrongly, haven’t I? It’s actually my Glassons cardigan – sorry about that! I love your hair on the bottom right, I’ve actually been considering chopping it off like that, I’m half way there but I keep chickening out! Also agree with the others, keep your hair the way you like the most, and at your wedding keep it “you”, will make for awesome pictures. I adore the photo of you with the sideswept fringe and a little flick! I’d love to see that look back, but I do think you should keep it long for the wedding – for no other reason than I’ve always wanted long hair for my wedding! Of course, I think you can rock any hairstyle, so good luck with the Hairy Godmother. Thanks Jess 🙂 My Hairy godmother was sick, and we can’t book another appointment for a month, so I’m taking that as karma telling me to grow the fringe out… at least for a while. Hi Lilli, I think you look stunning with the shortest of those hair cut photos. It is my favourite! However things are always different for a wedding! I grew my hair, and had a very pretty wedding hairstyle – However less than a week afterwards I went and had it all cut back to my normal short length (just in time for my honeymoon!). And I saw that nicolangela dress and your dress is SO like that! Good work on the non sale!!! You know what I think already, but for the record… Your dress will suit a romantic, elegant off-the forehead swept up hair style much better. You will look exquisite with long hair pinned with flowers or pearls or both, and dispense with the veil. You can do the perky fringe and short layered style straight after. I think you’re right, Mum. You look fabulous either way! I am also of the opinion that the side swept fringe is more romantic. Anyway, you will look stunning whatever style you go for, I am sure. Can’t wait to see pictures of you as a bride!